Brighton's skyline has changed over the past year as a tower has risen from the ruins of the old West Pier. I'd been aware that this was planned but somehow it never seemed real until the i360 reached its full height and the red light on its summit was suddenly visible from all around the city. And it was only when it did so that I realised it was tapping into something from my childhood, that I was more interested in it than I'd though I would or should be. Because one of the obsessions I had when very young was Towers. It wasn't the first obsession and wouldn't be the last. Over the years I would be obsessed with various subjects from Space Travel to Ants to Doctor Who to the London Underground. Whilst I don't necessarily remember how all of these started, I do recall the origin of the Tower obsession. It was around the time we moved from Birmingham to London. This was a bit of an upheaval for a three year old, especially given that, despite being London born, my memories (and therefore presumably my consciousness, my actual self) began in Birmingham. And so I found myself looking around this new larger place for reference points. Then I discovered one. From all over both cities you could see a Post Office Tower. Admittedly the Birmingham one was shorter, square in cross-section and somehow sawn-off looking, but nevertheless they were both iterations of the same thing. The city had the tower overlooking it. At this stage I guess my obsession only stretched to Post Office Towers. One of the highlights of the long journey from London to visit my grandparents in Gloucestershire was another Post Office Tower located off the A40 at Stokenchurch. 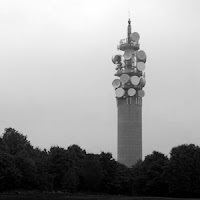 Like the Birmingham one it was shorter and truncated but nevertheless the alien look of the thing - the dishes, chunky wedges and delicate antenna set against a brutalist concrete core - excited me, making me feel I was in the presence of some inhuman and otherworldly titan. I seem to recall that back then I was half convinced that the towers could move. 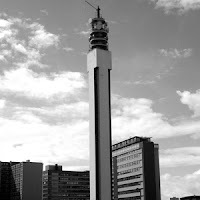 In the back of my parents' car in central London I recall looking in vain for the Post Office Tower only to spot it looming over (what I assumed) was a completely different part of the city. I asked my dad about this - he told me it had fallen over and been put up again in a different place (it was only later I realised that I'd got confused and that he was only joking). The Stokenchurch tower also seemed to move. It was one of the journey's significant punctuation points - a roundabout after a long stretch of road. 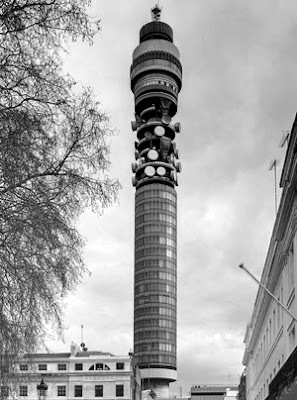 My memory is probably playing tricks but I clearly recall swinging through a roundabout overlooked by the tower. That childhood impression of an endlessly overcast misty grey day, the summit of the tower disappearing into the low cloud deck, the smell of warm plastic car seats, the terrible prospect of such a long monotonous journey ahead (and as a child those interminable journeys were a nightmare of stretched time). And then without any kind of transition I remember, the next time we made the journey the tower was simply visible in the distance from the motorway as the car cannoned along towards Oxford. I later discovered that this was due to our route changing slightly thanks to the construction of M40 extension, but the idea of these vast structures secretly moving around in the night is one that stayed with me. The Post Office Tower in London was the ruler of them all of course. It was, I read, the Tallest Building in the UK. I longed to go up it, to see what London looked like from that height but my parents told me that the viewing galleries were temporarily closed to the public due to a bomb. I always took this to mean that they would one day be reopened - after all how long could it take to repair bomb damage? - and for years looked forward to the day that I too could look out over London just like Steed and Gambit did in the New Avengers episode Sleeper.